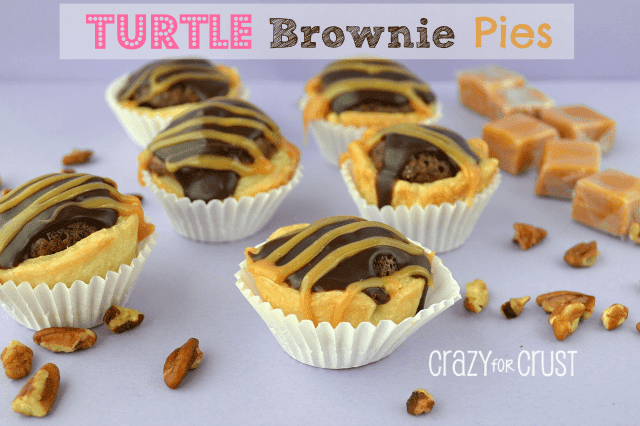 This Chocolate Caramel Turtle Cake Roll is out of this world! A chocolate cake rolled and filled with a whipped caramel then frosted with chocolate and pecans. 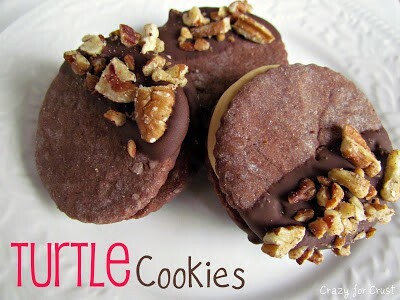 Turtle indulgence to the max! Have you ever been so afraid to try something that you worked yourself up into a frenzy about it and then convinced your brain you couldn’t do it so why try? Yeah, that was me and cake rolls. Until now. My mother-in-law makes a killer pumpkin cake roll every holiday season. It’s something I look forward to eating every year. She’s sent me the recipe, and even bought me a jelly roll pan a few birthdays back. But I’ve never made it. I’d never made any cake roll. I was too scared to. Like, you have to de-pan a hot cake, for one. How does that even work? Then you have to somehow roll it up? Without breaking it? Nope! Too scary to try! I proclaimed. Until now. Are you scared of cake rolls? Don’t be. Don’t make my mistake. Don’t pine away for a pumpkin cake roll 360 days a year for 11 years like I did. Get your bottom into your kitchen and use that darn jelly roll pan for what is was made for. I command it! I am serious, the ease of making this cake is unfathomable. It was easier to make than any cake I’ve ever made, ever. It starts with a box cake mix. I found the recipe in one of those Betty Crocker books you get at the grocery store. It used only part of a cake mix, and fills exactly one jelly roll pan. And, because it’s cake mix, it bakes up great. When the cake is hot, straight from the oven, you turn it over a (clean) kitchen towel that’s been dusted with powdered sugar. It comes out the pan easy, because there is foil lining the pan. Peel off the foil, and roll up the cake in the towel. It rolls easy – no ripping or universe exploding. I filled this cake with the caramel filling I used in the Banana Caramel Cake. Basically it’s caramels melted with heavy cream, chilled, and then whipped, almost like a ganache. A caramel ganache. It’s so easy to make and spreads like frosting. It’s true magic! Once the cake is cool, you simply unroll it carefully. It does not break or sprout a cape and fly across the room. It’s just…bendy cake. Frost the center with the caramel and roll it right back up. It’s happy to do so. Slice, and enjoy the fact that you have accomplished something amazing and magical. Something that should have been hard, but wasn’t. Something that everyone will think you slaved over and worked super hard for hours to make. 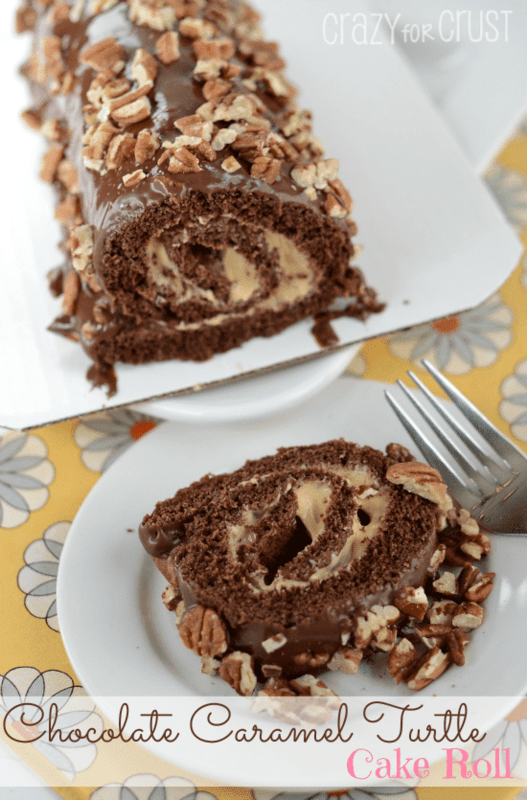 This chocolate cake roll is one of my favorite cake roll recipes! For a photo tutorial, check out my carrot cake roll. For cake roll rules, see my zucchini cake roll recipe. And for videos, be sure to see my peanut butter cup cake roll and birthday cake roll! 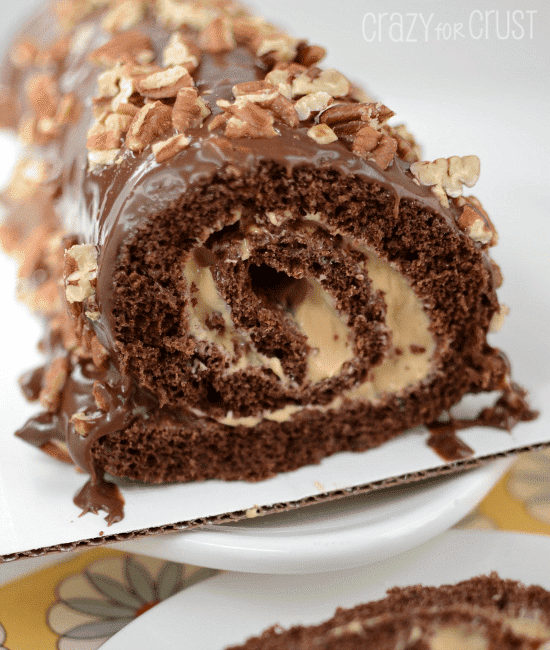 Chocolate Caramel Turtle Cake Roll - this EASY cake roll recipe starts with a cake mix! 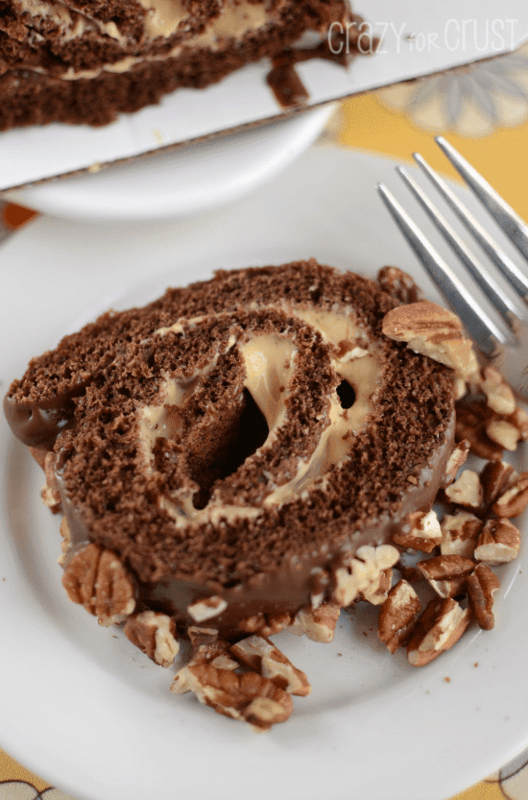 The chocolate cake roll is filled with caramel ganache and topped with chocolate ganache and pecans, like a turtle candy! Add caramels and heavy whipping cream to a large, microwave safe bowl. 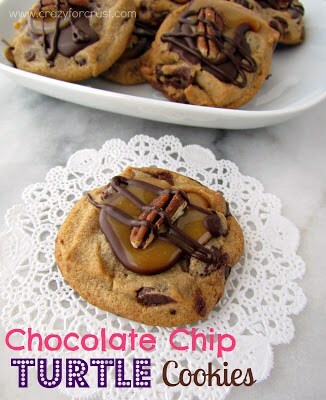 Heat about 2 minutes (up to 2 1/2) on HIGH, stirring every 30 seconds, until the caramels dissolve into the cream. Stir until smooth. Chill in refrigerator until completely cooled, about 2-3 hours. Preheat oven to 350°. Line a jelly roll (15x10x1-inch) pan with foil and spray with baking spray that has flour in it. Beat eggs in a large bowl on high speed for about 5 minutes, or until they are thick and lemon colored. Add cake mix, water, and oil. Beat on low speed for 30 seconds and then medium speed for 1 minute, scraping the sides of the bowl occasionally. Pour into pan. Bake 11-14 minutes, or until cake springs back when lightly touched. Do not overbake - mine cooked in about 11 minutes. Remove from oven and run a knife around the edges of the pan if the foil did not cover the whole thing to make sure the cake does not stick. Lay a clean kitchen towel on a flat surface. Sprinkle with the powdered sugar. Turn the cake upside down on the towel and remove the foil. While hot, roll up the cake in the towel, starting at the short end. Cool completely on a cooling rack, while rolled up, about 1 hour. Meanwhile, make the frosting: microwave the heavy whipping cream uncovered on HIGH for 1 minute, until it just starts to boil. Stir in the chocolate chips and corn syrup. Let stand 3 minutes and then beat with a wire whisk until smooth. Beat in vanilla. Refrigerate about 1 hour, stirring every 15 minutes, until it is spreading consistency. Once cake is cooled, remove caramel from refrigerator. Using a hand held mixer, whip the caramel until it is spreadable, like frosting, about 3 minutes. Unroll the cake carefully. Spread the caramel evenly over the cake. Reroll the cake. It should roll easily. Place the cake on a cooling rack with a cookie sheet underneath to catch any drips. Frost the cake with the chocolate frosting. Top with toasted pecans.